While the Architect of the Capitol's (AOC) core mission is to preserve the buildings in our care, we realize that to be successful, preserving knowledge is just as important as preserving the buildings. In a period of tightening budgets, success will be determined by investing in the employees of the AOC and in working better together. 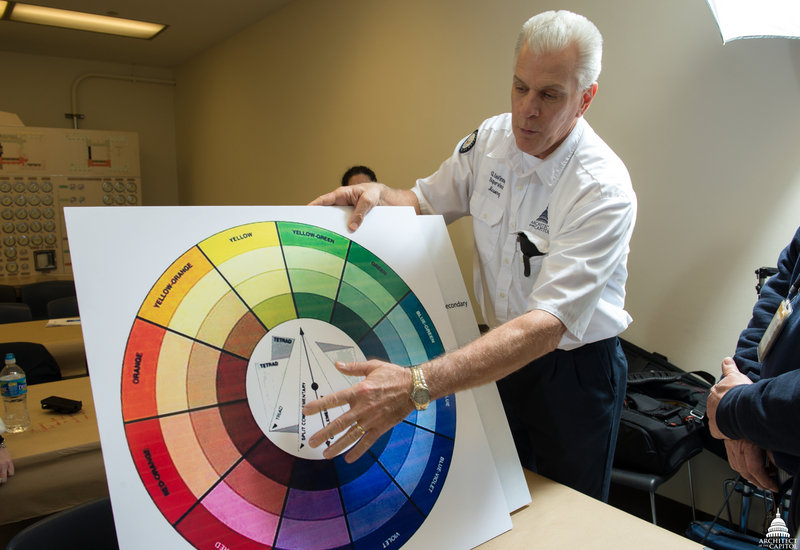 As veteran employees retire and walk out of the buildings they've spent decades preserving, all of their institutional knowledge goes with them. "The AOC has a specialized workforce and we're always looking for ways to try to capture in-house knowledge. I've met AOC employees that have worked in the same trade, but with different jurisdictions, for decades and have never met one another. After hearing that, I immediately knew we had to get them in the same room. There's so much they could learn from each other," said Peggy Hernandez, Chief of the Human Capital Management Division, Training and Employee Development Branch (TED). Two years ago, employees provided feedback via the Organizational Assessment Survey (OAS), which offered a snapshot of what the AOC was doing right and how it could improve in certain areas such as fairness and professional development. Across the AOC, new initiatives were developed to address employees' concerns, including expanding professional development opportunities. Two programs were developed to do just that, the Exchange of Critical Expertise and Learning (ExCEL) Program, and the Architect's Mobility Program (AMP). As a result of the OAS, the ExCEL Program was launched in the fall of 2013 and the number of AMP positions increased. The ExCEL Program provides opportunities for jurisdictions to work together and for employees to share their knowledge with fellow colleagues. By focusing on the unique goals of the individual participants, the ExCEL Program's flexibility opens the door to a variety of ways in which employees can grow and learn from each other. AOC's Scott Bieber and Andy Selby review the building automation system at Ft. Meade. Only a few weeks into his three month ExCEL detail with the Energy Management Control Systems (EMCS) Shop, Andy Selby, A/C Equipment Mechanic with the Supreme Court Building and Grounds, is surprised by how much he has already learned. "I've had a positive experience so far. I've learned things I wouldn't have attempted to do by myself at the Court, but now would feel very comfortable doing them, and I've only been here three weeks," he said. Scott Bieber supervises the EMCS team, which is part of Planning and Project Management's Design Services Division and handles building automation across the Capitol campus and at additional offsite facilities. The team is responsible for overseeing the HVAC, lighting and plumbing systems, as well as monitoring energy usage in all of the buildings. It plays a role in designing, engineering, installing and maintaining major systems campus wide, including air handlers, pumps, lights and even fountains, and also oversees the Building Automation Communication network. This particular partnership showcases how the ExCEL Program provides benefits for both jurisdictions involved." Andy will take the knowledge he's gained here back to the Supreme Court and will be more self-sufficient. He'll be able to troubleshoot on his own, which will help him better manage the building, and he'll have to rely less on my team for support," Bieber said. AOC's Gabrielle Downer was detailed to the Curator's Office for two months through the ExCEL Program, broadening her research skills. As Bieber's team works behind the scenes to keep the buildings up and running, it is the front-line staff at the Capitol Visitor Center (CVC) that works to ensure each visitor has a memorable experience. Gabrielle Downer and Julie Butler, both Visitor Guides in the CVC, were recent participants in the ExCEL Program. They were detailed to the Curator's Division for two months to learn more about the curator's responsibilities. They helped organize the division's archived files and assisted visiting fellows with their research projects, among other assignments. "I was able to enhance my research skills and learn more about all of the different items the Curator Division jurisdictions is a major initiative of the ExCEL Program, building relationships within jurisdictions is the focus for AMP. AMP allows employees who currently occupy career-limiting positions and lack qualifying experience to move into positions where they can gain a specialized skillset, enabling them to progress according to their abilities. Mason workers Sean Carpenter (left) and Fred Scott (far right) listen to Nathaniel Clayton describe the process to color match repaired stone as Mike Miller discusses the art of color matching with Mr. Ayers. "There are employees that have been here 30 or 40 years and are now leaving. Every time someone leaves, it gets harder to replace them. You just can't hire someone off the street and then expect them to know everything in two years. That's why AMP positions are so important. They can learn the basics of being a stonemason, but they also learn how to take care of the buildings that are unique to Capitol Hill. I make a point to engage the younger workers on my staff. I constantly talk to them, reminding them that one day they'll have to step up and lead the way for future generations," said Mike Miller, Mason Supervisor for Library Buildings and Grounds. Angela Davis observes House Office Buildings Stonemason Nathaniel Clayton demonstrate how to repair marble stone. One such employee to benefit from AMP is Angela Davis. A Masonry Helper with Library Buildings and Grounds, Davis was first hired in 2006 by the AOC's Senate Office Buildings' Labor Division. At the time, she was the only female laborer in the division and after applying for the mason AMP position in 2011, she became the first female employed in a mason shop. "I applied for the program because I wanted to learn a skill. Without the AMP Program it wouldn't have been possible because I didn't have the skills to be in the mason shop. I'm so grateful for this opportunity. I've looked at where I came from and where I am now, and this program was a wonderful opportunity," Davis said. 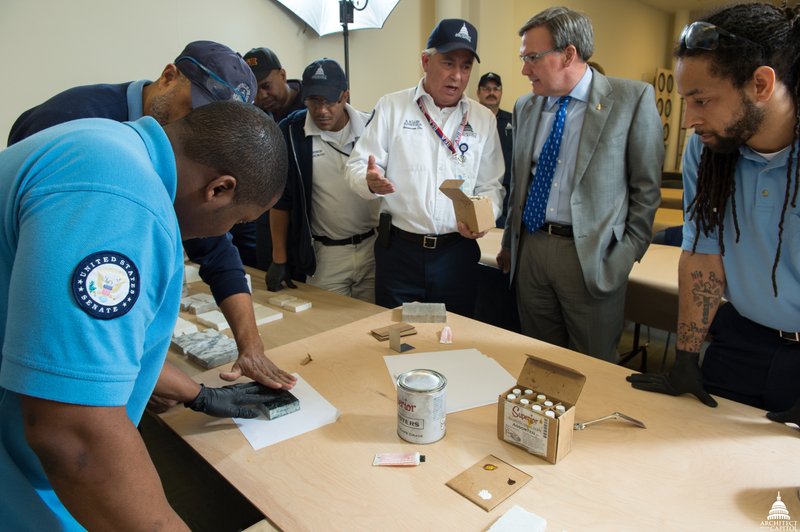 AOC's Glenn DeVinney instructs AMP employees on the basics of color matching for marble repairs. Glenn DeVinney, Masonry Supervisor for Senate Office Buildings, has recently worked with TED to develop training for stonemasons. Due to dwindling interest, there's not a lot of external training opportunities for the trade. Their collaboration led to the first ExCEL group event as employees from masonry shops across AOC jurisdictions attended the event this past spring. The event brought together 30-year veteran masons with those that have only recently begun to learn the trade. 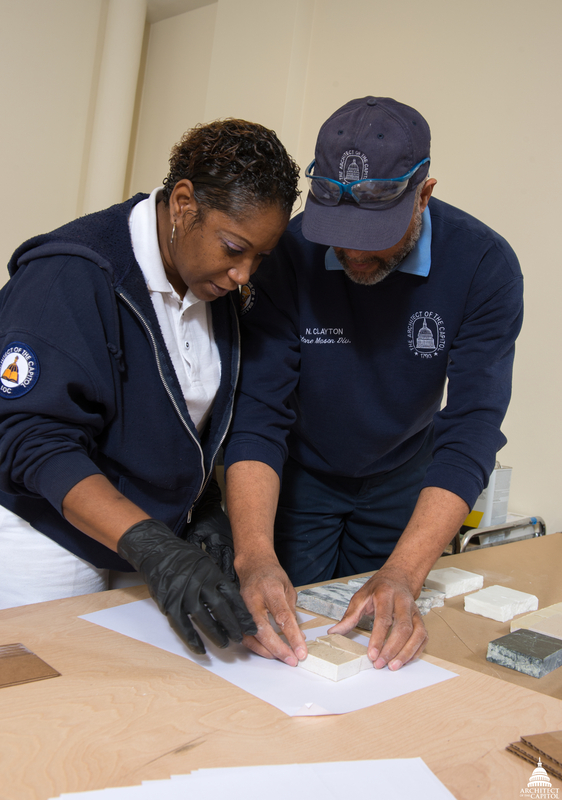 Instructors demonstrated techniques to repair marble and match colors on repaired stone. While the main focus of the ExCEL event was on educating AMP employees, James Bentley, House Office Buildings Mason Supervisor notes that everyone, supervisors included, benefitted in attending. "It was helpful for me to have a chance to talk to other supervisors about materials they're using and discuss best practices. Everybody learned something that day. Even those that have been here for years," he said. TED hopes to continue to build on the success of the first ExCEL event and plans to organize more group events in the future. "By continuing programs such as ExCEL, we are achieving organizational success by making the best use of our internal knowledge," Hernandez said. "Sharing and capturing that inherited AOC expertise is essential for our future." For more information about the ExCEL and AMP Programs, contact the Training and Employee Development Branch at 202.226.3068.